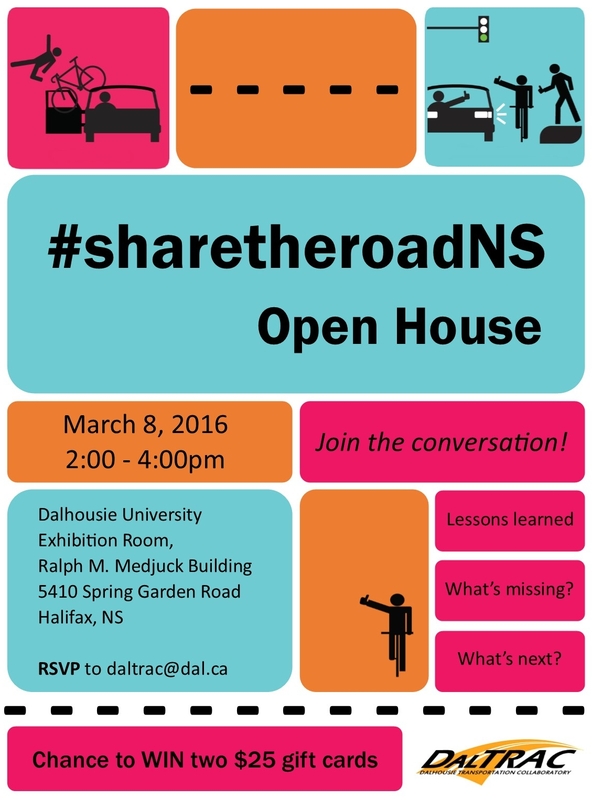 Join the Dalhousie Transportation Collaboratory (DalTRAC) for an afternoon of presentations and discussion regarding road safety and sharing in Nova Scotia. The open house will highlight the experiences of local organizations and municipalities across Nova Scotia on the challenges and benefits of raising awareness for road safety and thoughts on how to improve road sharing throughout the province. 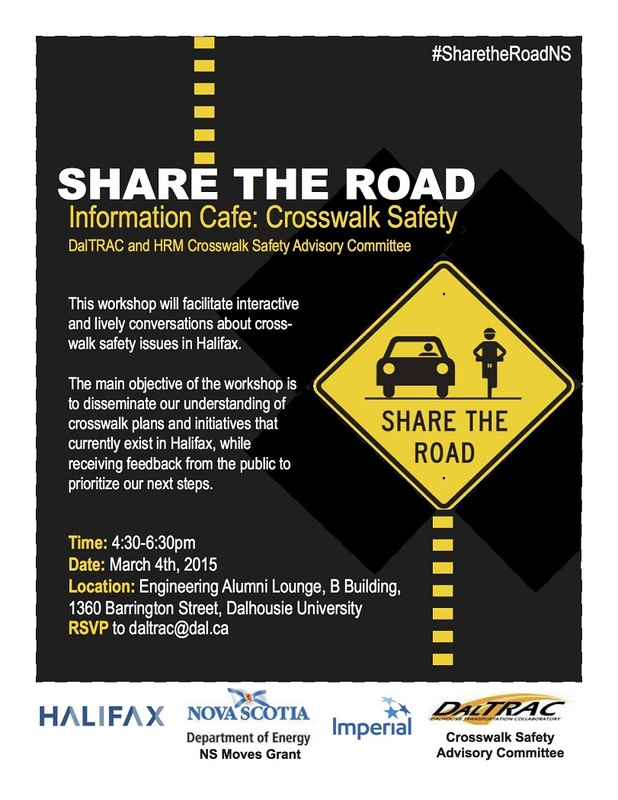 Join DalTRAC and the Halifax Crosswalk Safety Advisory Committee for an afternoon of interactive and lively conversation about crosswalk safety issues in Halifax. The goal is to disseminate our understanding of crosswalk plans and initiatives that currently exist in Halifax, while receiving feedback from YOU on what's working, what's missing, and what we should prioritize moving forward. Help us! Let us know how the campaign is doing! Thumbs up! Share the Road Nova Scotia is a community effort that supports safer roads in Nova Scotia. Please take 3-5 minutes to fill out this short survey! You will be entered to win 1 of 2 $50 gift cards! Survey closes on November 10, 2013. Introducing our first community video! We asked Nova Scotians: Why is Sharing the Road Important to You? Get Tune-up & Dressed for Nocturne! 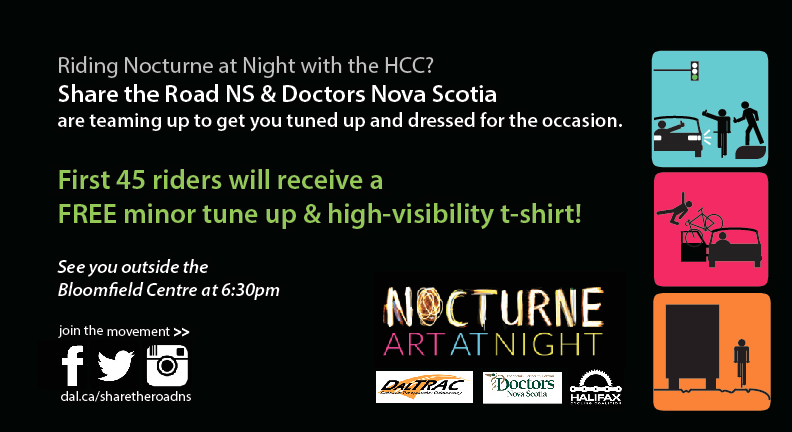 We are teaming up with Doctors Nova Scotia and the Halifax Cycling Coalition to get you and your bike ready for Nocturne on October 19, 2013. We will be offering free tune-ups and high-visibility t-shirts to the first 45 riders. See you outside the Bloomfield Centre at 6:30pm! Share the Road NS Halloween Special! Join us on Facebook throughout October 21-31, 2013 and Share & Tweet Winning posts for a chance to win from a large list of great prizes! Prizes include: Ipod Nano, $100 Visa giftcard, various MEC gftcards, oil changes, bicycle tune-ups and gear, and much, much more! Do you live in Annapolis Valley? 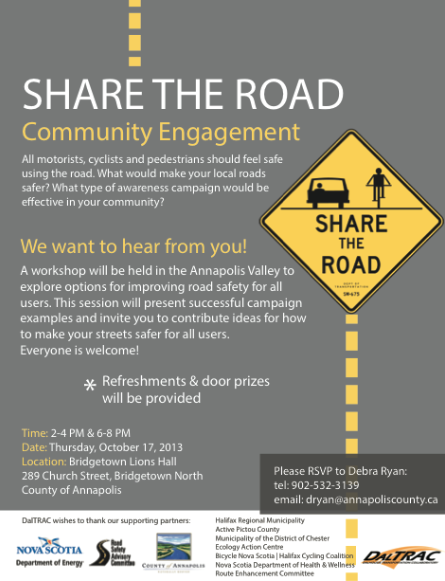 On Thursday, October 17 2013 we will be hosting two FREE workshops in the Annapolis Valley. *Please RSVP to Debra Ryan.